Zack and AJ are going to play baseball this summer with the Miracle League. Yesterday we attended the "try-its." As in, "come try it and see if it's something you'd like, and everyone who wants to play, gets to play." Truthfully, if you asked either of them if they wanted to play baseball they'd both emphatically say "no." We don't intend to ask them though, we're just going to sign them up and go for it. 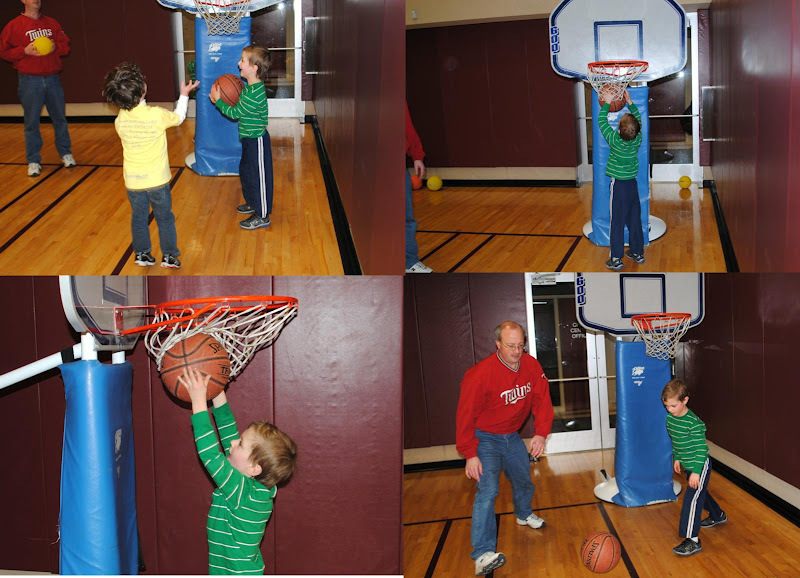 Since it's still winter and cold and snowy, the try-its were in the gym at Lifetime Fitness. It was a little loud and crowded at first. Think anyone will notice if we just push this door open and go out into the hall? We ran through a sort of mock baseball game, in which every kid got a chance to hit the ball, and then ran or rolled or was carried or in our case, was dragged around all the bases. When they started the game, Zack was just getting to a point where he was starting to take his fingers out of his ears, so I left Zack on the sidelines and dragged AJ over and guided him through the motions. He fought me hard, all the way. After he rounded home base and they tried to make him hit again, the tears began to fall and he stuck to my leg like a paperclip to a magnet. He recovered quickly, though, and I was happy he got through it The coaches said, and I'm sure it's true, that everyone is a lot more happy and cooperative and has a great time when they are outside. In the corner of the gym there was a low basketball hoop and a couple of balls. Zack decided basketball might be his game. A couple of years ago, I'd have been pretty upset at how much AJ seemed to hate the whole thing, how I had to force him to participate and how miserable he seemed. I would have been sad that Zack didn't want to play baseball, and just wanted to throw the basketball around in the corner by himself. But I've learned something about these boys. Practically every brand new experience is awful. And if we avoided everything they didn't like, we'd never leave the house. A little more "breaking in" and adjustment is required for Zack and AJ. I really feel, though, that this will be an experience they will both love. And we'll love watching them!